I had totally forgotten Cisco Carlos until I saw his baseball card and remembered that I had it. I can’t recall a thing about his playing career other than he was a pitcher. 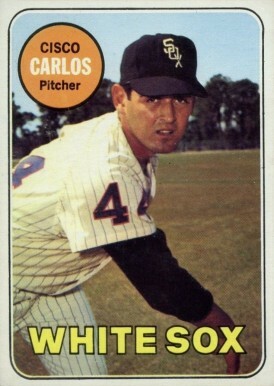 Carlos spent six seasons in the minor leagues before finally getting his shot in late August 1967. After a fine year in Double A in 1966 he moved up to AAA and had a stellar season in 1967 before getting the call by the White Sox who were in a big pennant race. Cisco won two games for them in September helping to keep them in the race. The infamous Sports Illustrated cover jinx must have gotten Carlos. In early 1968 he was on the cover along with Johnny Bench as the most promising rookies of 1968. Bench was immune from the jinx of course but Cisco went 4-14 with a 3.90 ERA. Ouch! Looking at his brief stint in 1967 with the Sox it is easy to see why they had high hopes for him. He started 7 games pitched in 8- was 2-0 with a 0.86 ERA in 41.2 innings pitched. Maybe it was a case of- and we see this still today- of a new pitcher to the league and it takes a while to get a book on him. After Cisco’s poor 1968 it was rapidly downhill for him. He was having an awful 1969 an ERA near 6 when he was sold to the Washington Senators in late 1969. He would pitch a few games for them the remainder of the season and a few in 1970 before going to the minors and never returning. For his career Cisco Carlos was 11-18 with a 3.72 ERA. He threw and hit right handed. 6’3″ 205. He was 26 when he made it to the majors and 30 when he left. After his baseball career Carlos founded Cabinets by Design- a kitchen, bath and storage design renovation firm in Phoenix and Scottsdale. Carlos is now 77 years old.